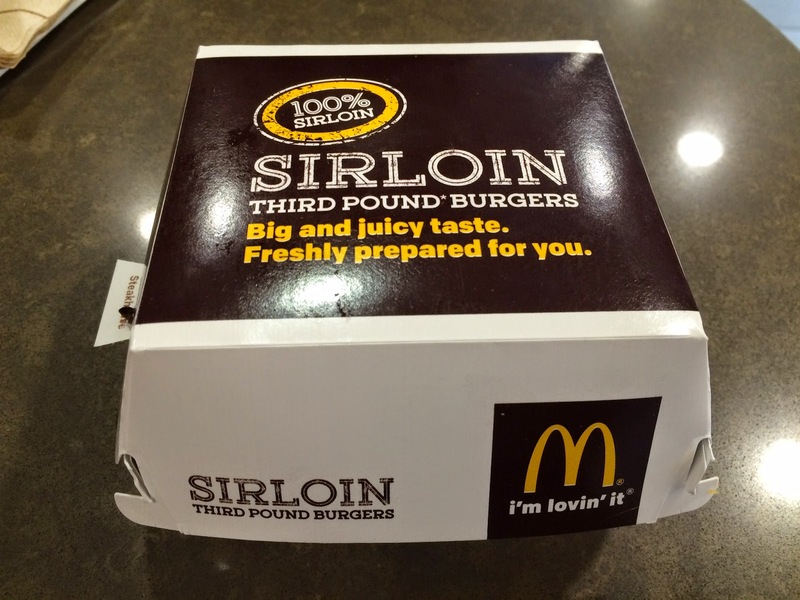 McDonald's launched 3 kinds of "Sirloin Third Pound Burgers" solely New York Tri-State from this week, and some source said it's available from the 7th, Tuesday. The only reason I could learn these special limited-time burgers is thanks to Burger Lad, and without the post, it was impossible to know this. As the name says and also the board shows, it's 100% sirloin patty, and each burger is between 4.99 ~ 5.79 dollars before tax, and can be make it combo by adding 2.86 dollars. Lettuce & Tomato, Bacon & Cheese and Steakhouse, and my husband said Lettuce & Tomato seems to contain mayo and it depends but sometimes I find bacon stinky, so I got "Steakhouse" to see how tasty it would be. Steakhouse contains grilled mushrooms and onions, white cheddar and peppercorn sauce, so I could get what it was without customizing. 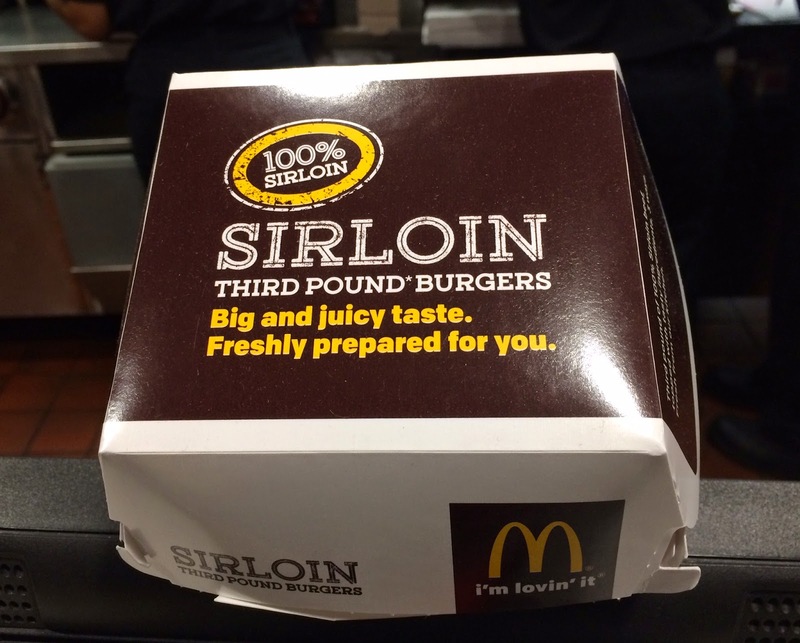 At the counter, each cash register had a box of Sirloin Third Pound Burgers to promote. Even before opening the box, I could smell strong mushroom flavor. 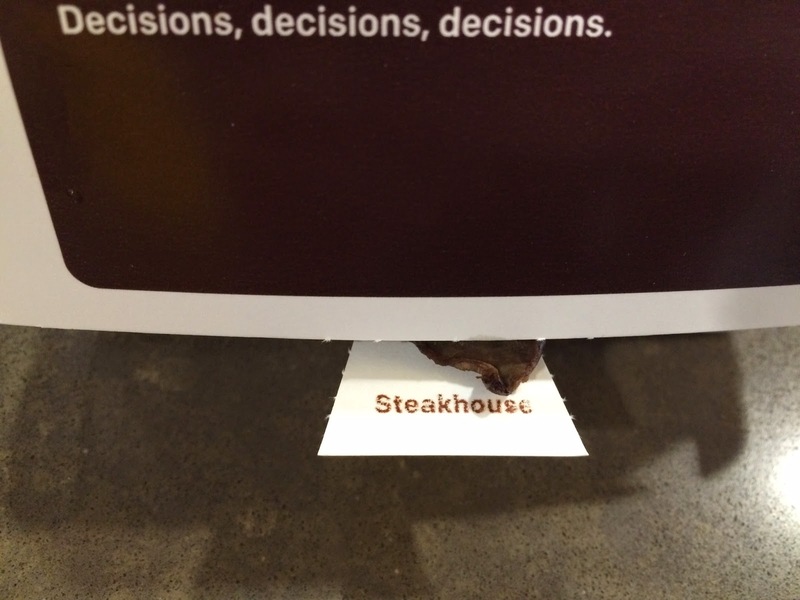 There's a mini tab with "Steakhouse." 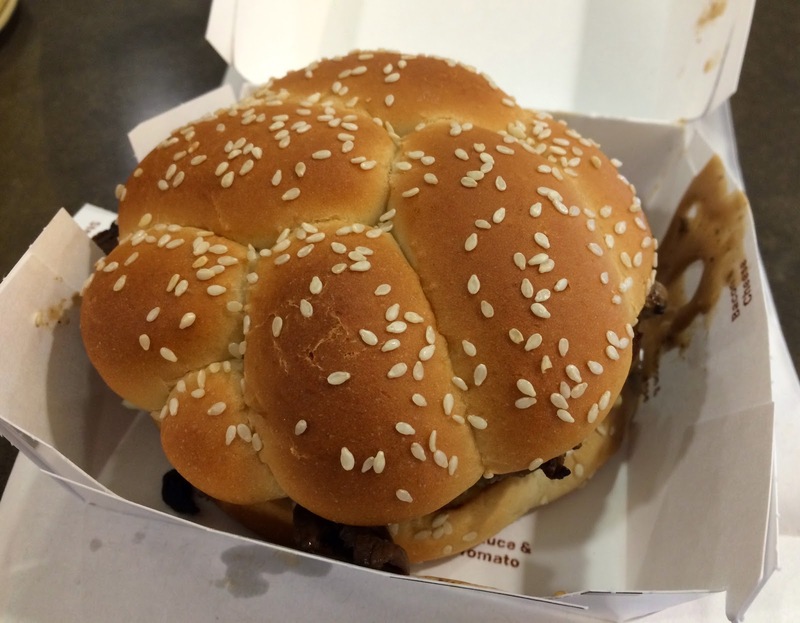 The bun had white sesame seeds like other burgers at McDonald's, but it's got several bumps and not a plain dome shaped bun. 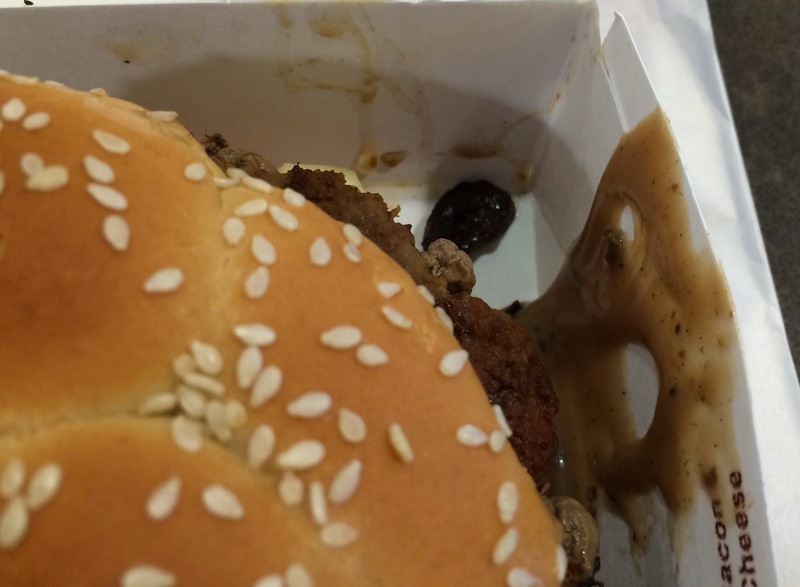 Before picking up the burger, I saw the sauce was already leaking to the inner box. 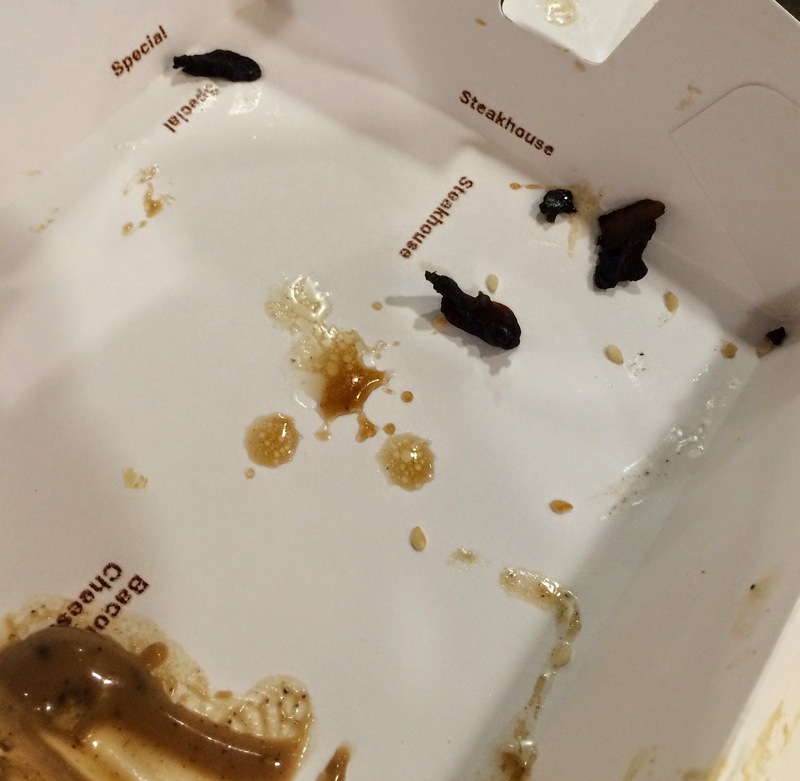 And some mushroom had slid off from the burger. 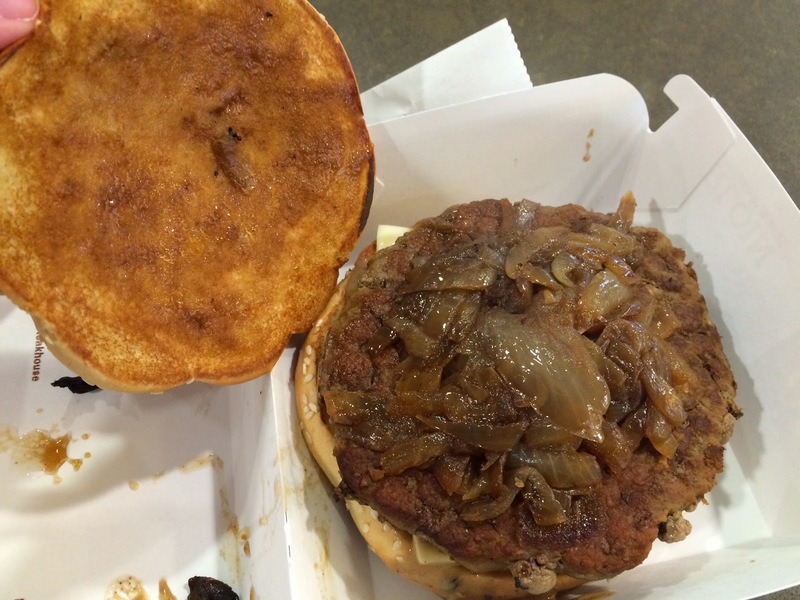 Under the upper bun, there're lots of grilled onions, and they're actually sauteed nicely. 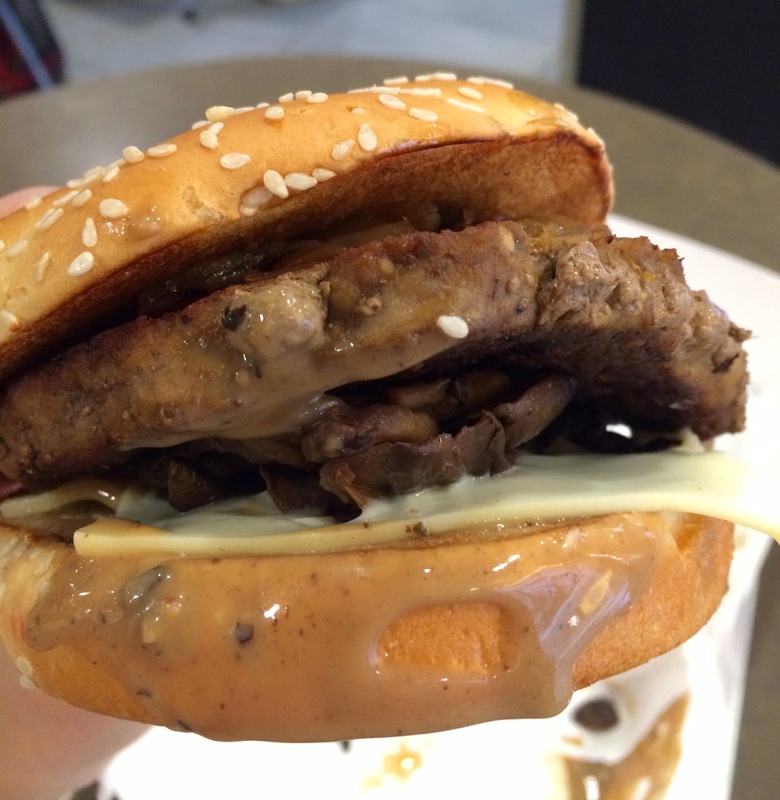 Under the sirloin 100% patty, there's a bed of grilled mushrooms. Some of them was almost black but they're not burnt at all. 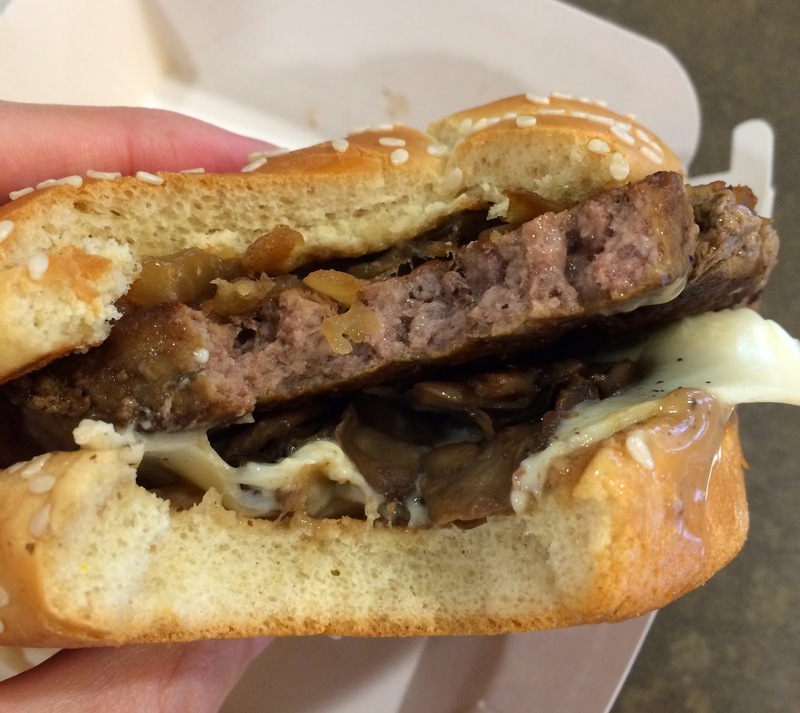 I don't know if you've noticed, but actually they didn't put the ingredients in the same order as the advertisement photo shows, that was upper bun, grilled onions and mushrooms, white cheddar, patty, white cheddar, sauce and bottom bun. 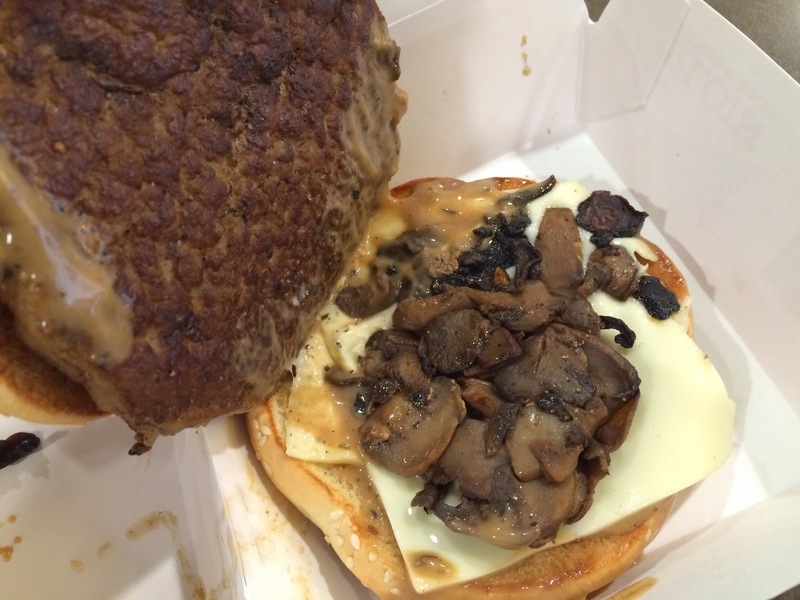 The actual product (at least the one I got) had all the correct items but not a picture perfect order; upper bun, grilled onions, patty, grilled mushrooms, 2 white cheddar slices, sauce and bottom bun. The peppercorn sauce was drizzling quite awfully, but it smelled really tasty. The onions still had some crispness and sweetness, and mushrooms was rich in flavor. White cheddar cheese was mild and it went well with other ingredients without providing too strong flavor in comparison with regular yellow cheese they use. Peppercorn sauce was runny but had subtle kick of peppers, and I liked it as it was, but it'd have been tastier if it had stronger pepper flavor to add an accent. 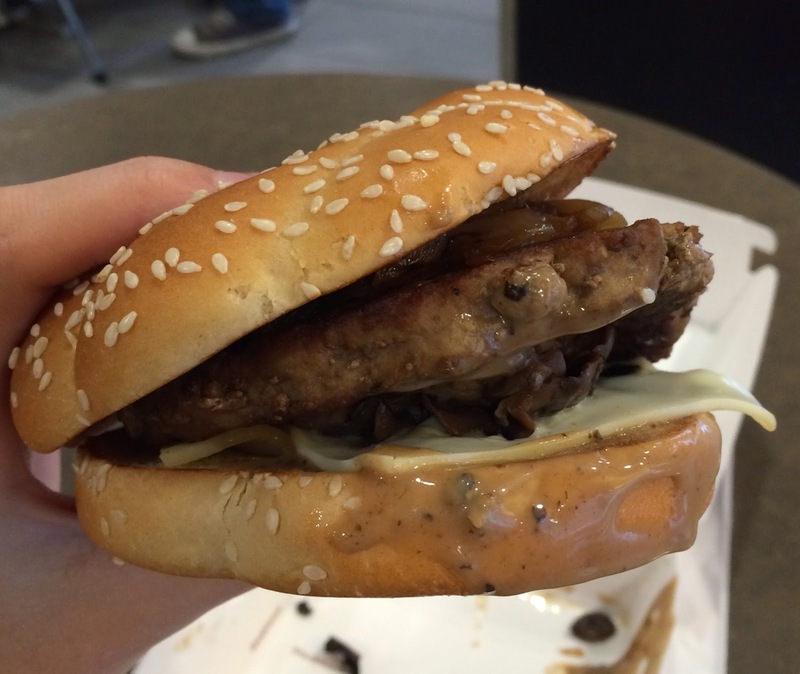 Regarding the patty, it's much juicier and more flavorful than regular patty, but the chunkiness was about the same. Sometimes the patties are dried, but this specific piece I got was nicely cooked without burning or drying. I saw some grease dripping from the patty while holding it. I really enjoyed this burger, especially the sauce and patty, and it's worth walking for 30 minutes in the rain. At the first branch I went to, one of the employees said, "I don't know about the burger." Then, another employee said, "We have it, but not today. I'm not sure when we'll receive it [the ingredients]," which didn't really make sense. I guess not all the branches in NY, NJ and CT serve the special burgers.